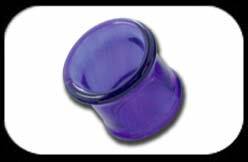 Single Flared Flesh Tube made from blue Pyrex Glass. Sizes 3 - 12mm. These glass tubes are single flared but do still have a small lip at the back.